Bridge to Nowhere The former McPhaul Bridge that has been abandoned for 80 years but still seems to be in surprisingly good shape. 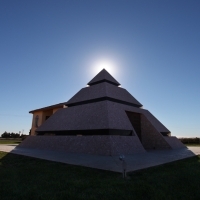 Henry Harrison McPhaul was a former Yuma Territorial Prison Guard, sometimes known as Hard Rock Harry. The only Yuma resident to ever become an Arizona Ranger, Henry spent many of his later years prospecting for gold on his land near the Dome Bridge over the Gila River. He was such a regular sight that eventually the bridge was renamed in his honor - the McPhaul Bridge. 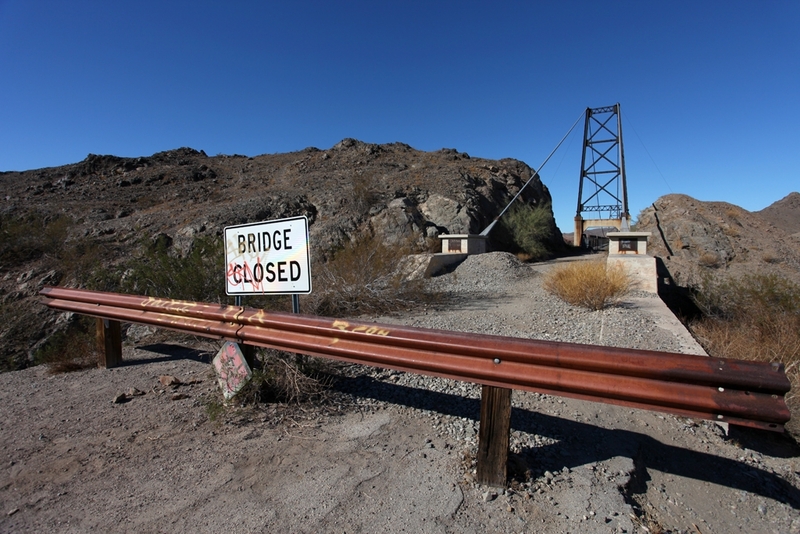 The bridge was originally built in 1929 as a way for travelers on the Yuma to Quartzite road to cross the - then presumably raging - Gila River. 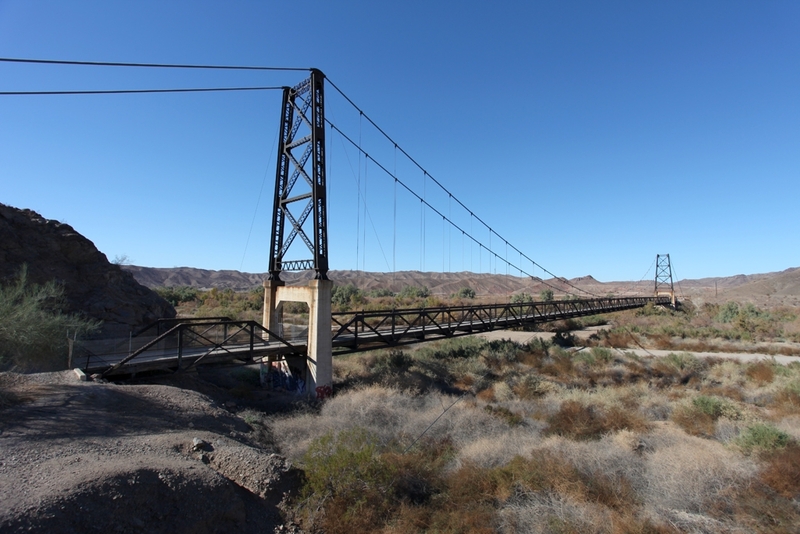 It was the longest suspension bridge in Arizona at 798 feet and a beautiful specimen of the era. But after 39 years of service, there was concern that the bridge wouldn’t be able to carry the increasing weight and size of modern traffic and the road was rerouted to a new simpler bridge in 1968 thereby ending its life as a useful piece of infrastructure. But the bridge lived on, even as the Gila River there didn’t. The river bed seems completely dry now perhaps except for the occasional flash flood. The bridge is in remarkable shape, for the most part it looks like you could still drive across it without issue, though perhaps a bit narrow for your modern SUV driving American. There was a fire in 1990 which burnt part of the road way, but the joke was on the replacement bridge when 3 years later in 1993 it was destroyed in a flood while the original McPhaul Bridge survived just fine. Bridge to Nowhere The long since abandoned McPhaul Bridge in profile. It really looks like it could still be used today. The bridge is accessed from a little farm stand that has tacos and date shakes, you just park in their lot and the old road leads up to the bridge. It is fenced off in a couple of places but it is some pretty passive aggressive security until you actually get on to the bridge. You can pretty much go where ever you like on, around and under it without much in your way. 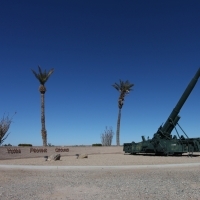 It is probably a half mile or so away from the Tiny Church and is a great place to stop between quartzite and yuma (as that is what it was designed for) or if you are visiting the Atomic Cannon at the proving grounds.